SUBWAY SOUL CLUB in Times Square! Mr. Fine Wine cues a record as Smokey Robinson and the MIracles do “Mickey’s Monkey” behind him! Exactly one week less than a whole year after its last event, Subway Soul Club returned to action on May 9 at a new location and with two incredible guest DJs, but with the same exciting groove, Lady Dawn at the helm, and with the extra-added production help from our good friends at Cavestomp! Lady Dawn is all sparkly and swingin’ at Subway Soul Club! The location was Lucille’s Super Club, a groovy joint that is adjacent to, or actually inside, B.B. King’s Blues Club on 42nd Street in Times Square. 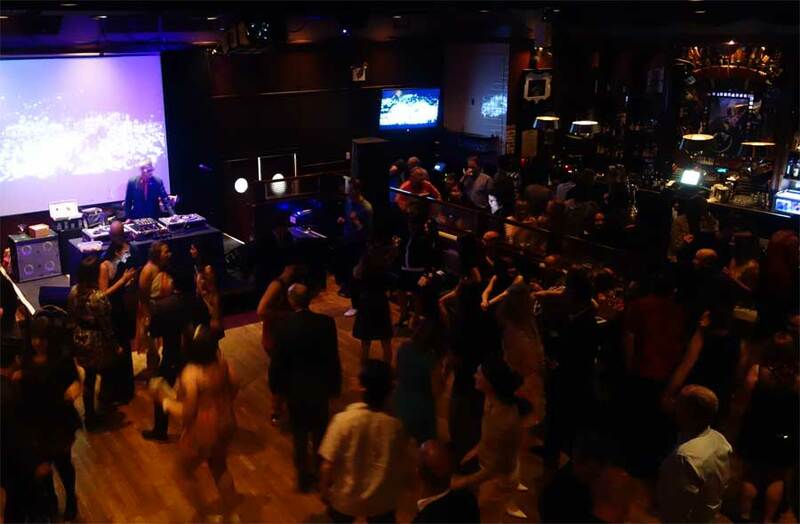 The venue has an ample dance floor that was full of dancers nearly all night long. 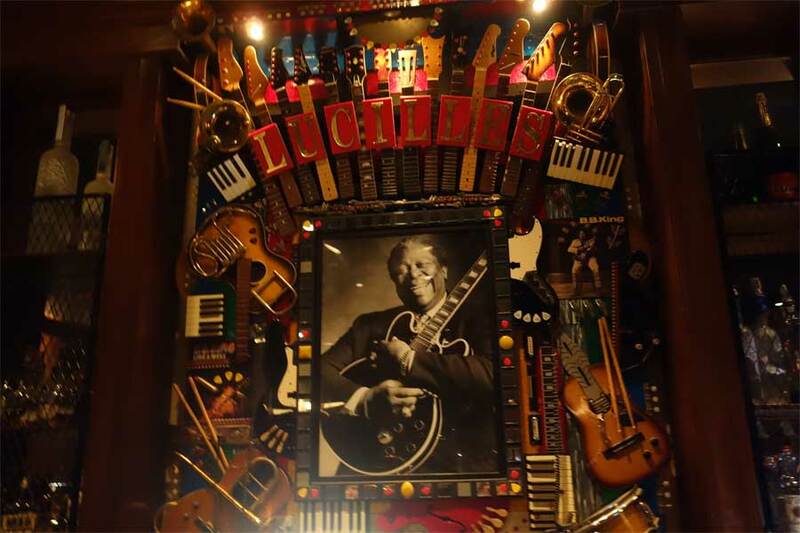 The place serves excellent southern style soul food and, with a photo of the great B.B. King overlooking the bar, you know the place was perfect for a Subway Soul Club dance party. Guest DJs were Mr. Fine Wine and Mikey Post. Mr. Fine Wine is highly regarded by the Boogaloo Bag writers. 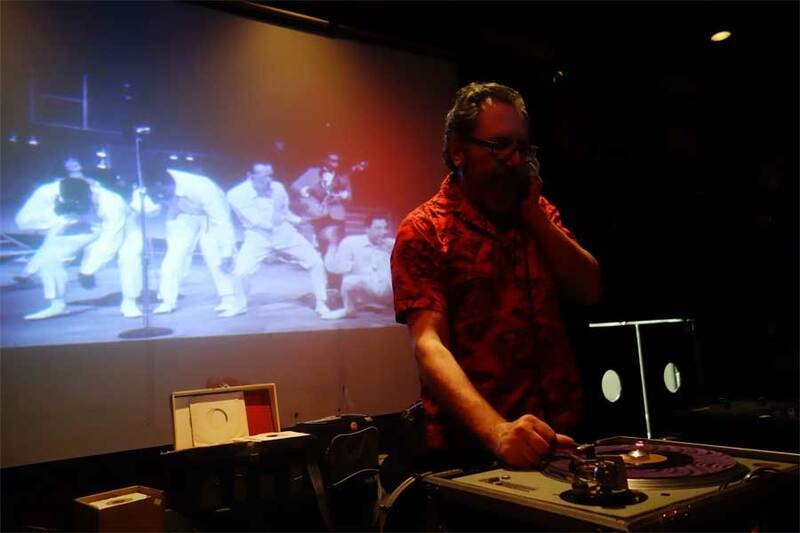 His presence on the sixties soul music scene is strongly felt in this town, with his radio show Downtown Soulville every Friday on WFMU and his Wednesday night shindigs at Botanica—both of which have been taking place for more than fifteen years. These days you can find him on the third Friday of the month at the Commodore on his Thee Knights of the Round Tables gig and also the third Saturday of the month at Friends and Lovers, a cool joint in Crown Heights. He also DJs around the country and around the world. Cat is busy and wherever he is playing records, you know the place is going to swing! Dance action at Subway Soul Club! Mikey Post is another busy cat: He is known as “The Custodian of Soul” at Daptone Records, where he works, and he is also the drummer for two great teen combos, The Reigning Sound and The Jay Vons (and he may still drum with Naomi Shelton and the Gospel Queens). He is also one of “Thee Knights of the Round Tables” at the Commodore (along with Mr. Fine Wine and DJ Young Chris). Lady Dawn recently witnessed one of Mr. Post‘s DJ sets somewhere and insisted that he be one of the guest DJs at this Subway Soul Club. Cat has great records, and man, he can play them! Subway Soul Club’s resident DJ Phast Phreddie the Boogaloo Omnibus also brought a couple good records to the party. However, he was saddened when he realized that the Subway Soul Club event would take place on the same night that Dig Deeper was to take place in Brooklyn. Dig Deeper, as the Boogaloo Bag reader knows, is the live music night that features a great obscure soul (or sometimes ska) entertainer—usually peforming for the first time in decades—and the superb record playing of its two hosts, Mr. Robinson and DJ Honky. On May 9, the Dig Deeper featured performer was ska/rock steady singer Derrick Morgan, so there wasn’t a major conflict. However, the Dig Deepers announced that it will be their last event for a while and the Boogaloo Bag writers were sorry that they could not be there to show support for their most excellent series of shows. In a perfect world, the Dig Deeper folks would be given the Presidential Medal of Freedom for the fine work they have done—and hopefully will do again. Meanwhile, back at Lucille’s, Subway Soul Club swung like an old Count Basie 78! Folks were dressed up and ready for a night in the big city, dancing and drinking and carrying on. Except for some confusion dealing with the cover charge, the night was a major success. Lady Dawn danced around in a shiny, black Go-Go dress and greeted about two dozen British citizens who were in town on business or vacation. She and Phast Phreddie were also very happy to see so many familiar faces—people who have attended Subway Soul Club since its earliest days. Knowing that folks feel so strongly about Subway Soul Club, that they even come to the event when they take place once a year… well it puts a great big smile on the face! Negotiations with Lucille’s are taking place so another event may take place sooner, rather than later. Also, many of the attendees asked that all three DJs submit a set list (or reasonable facsimile thereof) and the two guest DJs graciously complied. The Boogaloo Blog is very proud to host these set lists. Mikey Post swings at Subway Soul Club! Mr. Fine Wine tells us that his list may also not be in order. Note that he actually played a song by B.B. King! Mr. Fine Wine swings at Subway Soul Club. B.B. King, Poontwangie (Kent) HAD TO PLAY A BB KING RECORD AT BB KING’S! Phast Phreddie the Boogaloo Omnibus swings at Subway Soul Club! It is very doubtful that any of these records are for sale! Click on the photos and they will electronically big-o-fi! Roll your curser over song titles and click on links to actually hear some of the records! Thanks to our pal Sid Griffin for the tip on the Guardian article. This entry was tagged 45 RPM records, BB King, Daptone, Lady Dawn, Mr. Fine Wine, Northern Soul, Sixties soul music. Bookmark the permalink. Absolutely killer set lists! I am sure that was a night to remember. Keep it up Boog!